The MATRIX-200 is the most compact member of our popular B -52 MATRIX family of active systems. Compact, powerful and portable the MATRIX-200 delivers clean, accurate sound ideal for both stage and music playback applications. The MATRIX-200 has a true 200-watt RMS stereo amplifier, built in 5-channel mixer, studio-quality digital effects, phantom power and numerous patch inputs / outputs. The MATRIX-600 i s the first compact all-in-one system so rich in performance it will leave you looking for a hidden subwoofer. The custom designed, high-fidelity 10” 3-way speakers are powered by a robust 2x300 Watt RMS stereo power amplifier that incorporates specialized equalization and limiter circuitry to enhance the performance of the loudspeakers. The result is an astonishingly clean and accurate sound unattainable from traditional 2-way systems. The MATRIX-600 is a compact yet powerful system that delivers maximum SPL, a ruler flat frequency response and a wide dispersion pattern. With its exceptional performance, bullet-proof reliability and amazing value, the MATRIX-600 has set a new standard for our competition to follow. The SL-Series is designed for the true professional unwilling to make any compromises in the quality of their sound. Designed for live sound and music-replay applications, the SL-Series provides maximum SPL and sound clarity from reliable and cost-effective cabinets. 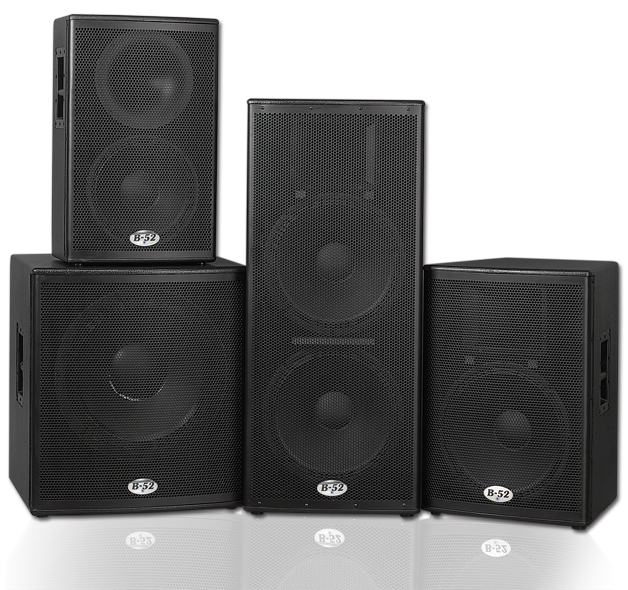 The SL-Series is ideal for mobile DJs, live sound, nightclubs and equipment rentals. 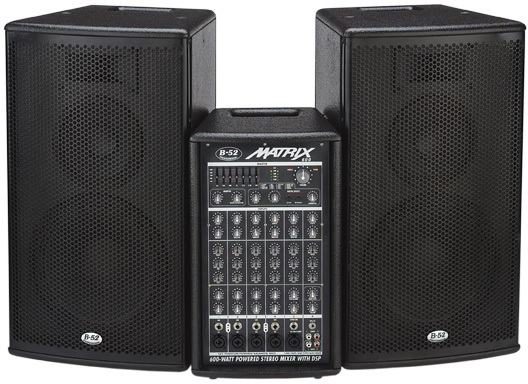 The MX-Series is designed for live sound, small venue installations and mobile DJ/KJs. It offers exceptional performance and value from compact and powerful systems. B-52 components include high performance loudspeakers and 1” exit titanium diaphragm compression drivers. Each rugged cabinet features metal bar handles, 16-gauge perforated steel grille, rubber feet and protective metal corners. Input connectors include (2) 1/4” metal phone jacks and a genuine Neutrik™ NL4 connector. The new ACTPRO Series is an advanced line of made in the USA powered loudspeaker systems that offer the sonic accuracy, power and reliability demanded by today’s professional performers. Fuelled by B-52’s ultra-efficient Class-G amplifiers, ACTPRO systems deliver rich, clear sound at extreme SPLs. ACTPRO amplifiers employ sophisticated circuitry including acoustically tuned 4th order crossovers, four stages of equalization, a built-in intelligent compressor/limiter and short circuit/over-current protection.